Traditional features such as the single-frame grille, trapezoidal headlamps, prominent shoulder line and wraparound tailgate combine to give the Q3 an unmistakable Audi flavor. Audi has lifted the veil on the new Q3, revealing the compact SUV for the first time ahead of a planned public premiere at next week's Shanghai motor show. 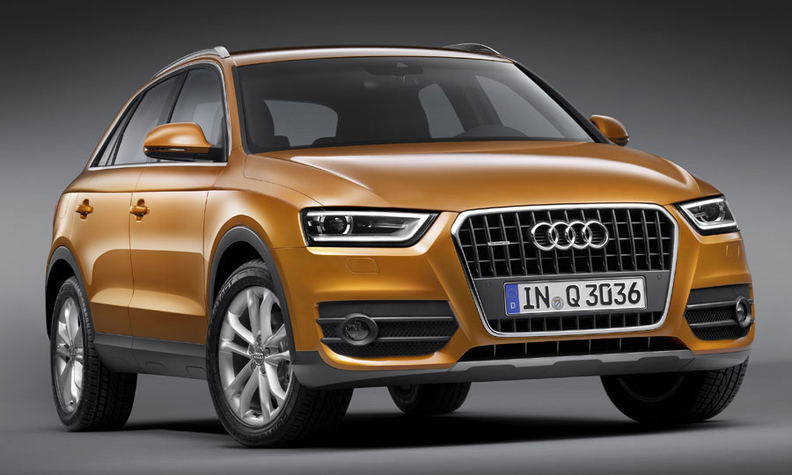 Set to go on sale in June in Europe, the Q3 is Audi's third dedicated SUV model, following the Q5 and the Q7. The Q3 base price in Germany will be 29,900 euros. Audi officials are remaining tight-lipped on plans to put the five-seater on sale in North America, although it might hit U.S. showrooms late next year as a 2013 model. The Q3 is based on the same platform structure as the recently facelifted Volkswagen Tiguan, with which it also shares transversely mounted engines and gearbox combinations. The Q3 is the latest entry into a crowded compact-SUV market. Its chief rivals include the strong-selling BMW X1, the soon-to-be-launched Land Rover Range Rover Evoque and the upcoming Mercedes-Benz GLC -- the latter which is based on modified underpinnings from the second-generation B-class due out later this year. Previewed as a sportier three-door concept at the Shanghai motor show in 2009, the five-door Q3 continues the current Audi design lineage with a clean and unadorned exterior with a clear upmarket appeal. Traditional features such as the single-frame grille, trapezoidal headlamps, prominent shoulder line and wraparound tailgate combine to give it unmistakable Audi flavor. The Q3 has weight-saving measures including the adoption of an aluminum hood and tailgate, although the remainder of the body is made from high-strength steel. Extensive wind-tunnel testing leads the Audi adopt a flat undertray and results in an impressive 0.32 coefficient of drag. The Q3 will be offered in Europe with the choice of three engines, with a fourth unit planned to be added to the lineup toward the end of the year. Included in the launch lineup is a 2.0-liter, four-cylinder direct-injection gasoline unit making 168 hp in the initial base version of the junior off-roader that can be specified with either front- or four-wheel drive. At the other end of the lineup is a more powerful 208-hp version of the same gasoline engine running added turbocharger boost pressure and available exclusively with all-wheel drive. The only diesel available from the outset of European sales will be a 175-hp version of Audi's 2.0-liter common-rail engine, which like the range-topping gasoline unit can only be had with all-wheel drive. Also planned is a 138-hp version of the diesel that runs either front- or all-wheel drive. Gearboxes include a standard six-speed manual on the lesser gasoline and diesel units and a seven-speed S-tronic dual-clutch for the top-end engines. The S-tronic gearbox comes with optional shift paddles, and as a first on any Audi model, it uses a clutch to disengage the engine and allow the Q3 to roll freely without any mechanical drag on a trailing throttle when the driver dials up efficiency mode. Unlike the Torsen-based all-wheel-drive system of the Q5 and Q7 models, the Q3 relies on a simpler and lighter Haldex multiplate clutch arrangement, as used on the Audi's sister ute, the Tiguan. Further traction enhancement comes by way of an electronic differential lock integrated into the standard electronic stability program. The Q3 attempts to trump its compact-SUV rivals with a typically high-quality interior. The dashboard flaunts a design common throughout the Audi lineup, as do the instruments, switchgear and trims. Accommodation is claimed to be on par with the Tiguan, with seating for up to five adults. As has become typical for Audi, there is a long list of options. Included are high-end items such as a Bose surround-sound system with 14 individual speakers, a hard-drive-based navigation system that operates in combination with a seven-inch color screen, onboard Internet and a parallel-parking assistant that uses 12 ultrasonic sensors to steer the car into tight parking spaces. Production of the Q3 will take place at Volkswagen Group sister company Seat's underutilized Martorell factory near Barcelona in Spain. While Audi hasn't officially announced any volume targets for its latest model, insiders say internal sales studies point to a potential for up to 100,000 sales annually.